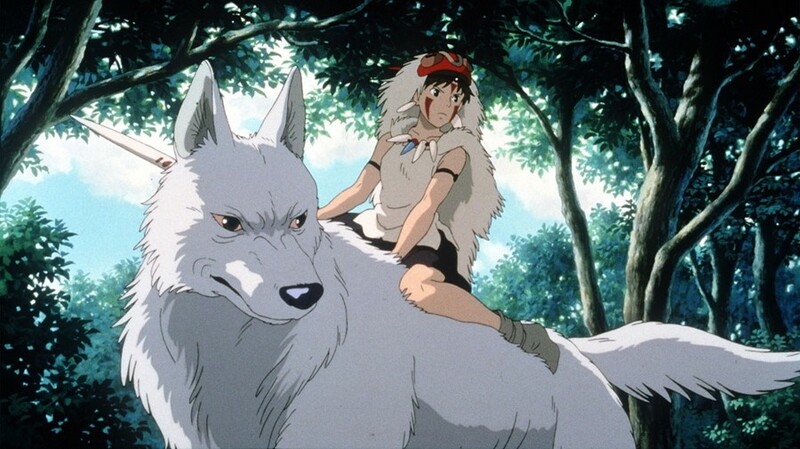 Hayao Miyazaki’s stunning Princess Mononoke (Mononoke Hime) turns 20 this month. Released on July 12, 1997 in Japan, the prolific animation maestro’s bloodiest film remains one of his most politically poignant tales. It’s also more relevant today than ever before, its message about environmental protection a staggering reflection of our current bleak – perhaps even doomed – relationship with the earth. Just this morning, a 1 trillion tonne iceberg, Larsen C, broke away from Antarctica. It is roughly the size of London. As our scientists, activists and environmentally woke frantically try to impress the gravity of our continued actions upon the public, we can look to Miyazaki’s most violent film as a forewarning about the dire consequences of our accelerated ecological destruction. A cautionary tale of gods and mortals set in feudal Japan, Mononoke is about war, accountability and redemption. On his journey to find a cure for a fatal curse, the prince of a rural village encounters San, a feral young warrior woman who was raised by wolves in the woods, as well as Lady Eboshi, the leader of Irontown, an industrialized settlement that has waged war on the forest surrounding it. In her quest to continue building for the benefit of her people, Lady Eboshi seeks to totally destroy the Forest Spirit (aka nature). Though Mononoke operates as a sweeping fantasy epic, at its core lays a complex fairytale about the critical importance of balance between man and nature. Much like our own society, there is no one absolute villain – well, mostly: Donald Trump is practically a cartoon eco-super villain at this point – but rather, the stakes are weighed against the scale of harmony between human civilization and the earth it inhabits. There is a delicate give and take, a necessity for both industry and untouched nature – a dichotomy that San and Lady Eboshi, two forces on opposite sides of the spectrum, come to understand by the film’s end. Speaking at the Toronto International Film Festival in 1999, Miyazaki shared his mission with reporters: “What did (the children) see, and what did they encounter in this film? I think you’ll have to wait for about 10 years for them to be able to grow up sufficiently to be able to articulate their emotions about it.” And so, 20 years later, Mononoke’s desperate warnings to respect and find balance with our environment have grown even louder in the two decades since it was released in Japanese theatres. “The humans are gathering for the final battle. The flames of their guns will burn us all,” the wolf responds, stoic and angry. As war erupts between the human inhabitants of Irontown and the animal spirits of the forest, the rage of the forest proves more powerful, brutal and uncontrollable than the humans could have ever imagined – much like the horrors that await us if we continue down our present path. Industrialization is not inherently evil. Industry has presented society with an array of invaluable jobs, protections, innovations and opportunities. Instead, it’s how we as a society utilize our industrial means to advance our civilization where issues of toxic human ego arise: pollution, war, deforestation, species extinction, climate change. Unlike the complex, ultimately compassionate players in Mononoke, we have denied responsibility and thrown our world off-balance in our quest for advancement and profit; as a species we seem to have learned nothing, despite the scientific warnings and crumbling Antarctic ice shelves. And so, rewatching Princess Mononoke today in 2017 should tap deeper and more urgently into our collective anxieties about what it means to cohabitate on this planet. As we teeter on the precipice of certain catastrophe in real life, the classic anime serves as a significantly nostalgic, impactful meditation on our circumstances, how we got here, and what we can do to fix it. At the end of the film, when balance has been restored to the forest and the once-ravaged wasteland begins to grow green again, one of the inhabitants of Irontown soaks in the peaceful scenery around him. “I didn’t know the Forest Spirit made the flowers grow,” he murmurs, turning to Lady Eboshi, who promises to “build a better town,” one in harmony with nature. And what of us? Can we too, like San and Lady Eboshi, lay down our arms and build a better world before it’s too late? Will we continue to ignore the warnings, thereby fatally cursing ourselves and our planet? And if we continue to burn our sacred forest to the ground, what flowers will be left for us and our children?